There has never been a better time for children's books. The breadth and diversity of the books available is amazing. At Winstone's we are committed to encouraging children to be lifelong readers. Our very experienced team of booksellers can help you find the write book. we stock approximately 3500 childrens books, visit us soon and browse our favourite children's books, old and new. If you would like to write a review of your favourite children's books please email it to us here. Come and visit our beautiful children's department. We have a wide range of exciting books from well established authors to new talent. We also have a range of non fiction and educational titles for support with school and homework. There is an area to sit and read with a gorgeous handmade rocking horse for children to ride on. Each time you purchase a Children's book over £5.99 we stamp your Collector's Club Card. Once you have collected 8 stamps you can choose a FREE children's book up to the value of £8.99. 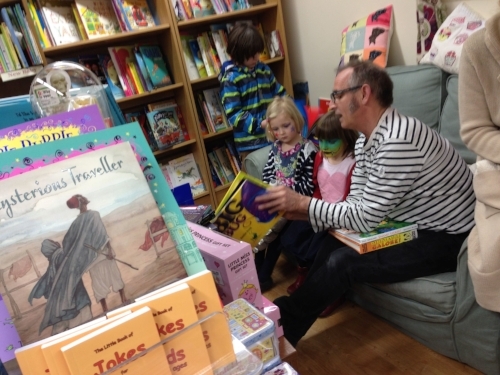 Wayne Winstone: For many years I was the Children's Director at Ottakar's and then held a similar position at Waterstone's and I believe that stimulating a love of reading and books amongst our children is one of the most important gifts we can pass on.